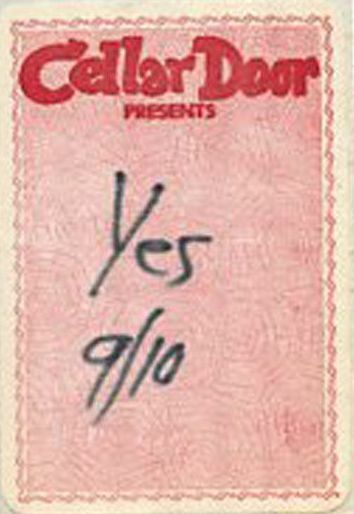 First Yes Show I ever saw, just as I was entering my senior year of high school. Having seen only one other big rock touring act prior (Clapton), I had no concept of what I was watching or how sophisticated it must have been to present the 'In The Round' configuration. 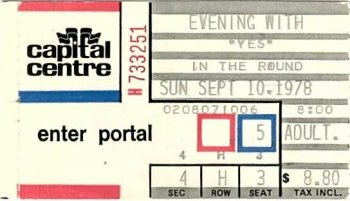 There was no opening act and the concert was billed "An Evening with Yes". Seemed very classy for a rock show. I remember Jon in this drapesy yellow outfit prancing about like a cosmic faerie thinking (embellished slightly from memory) "its 1978 and there are persons still being paid to be hippies!" It was just too cool that Jon was so loose looking and lilting about in what seemed like elf socks. They all had long hair (still) and I was just delighted they resembled the photo liners on Yessongs. I had always lamented my being born too late which caused me to not even be aware of them during those exciting early 70s tours, especially the '72 tour. The experience was overwhelming and otherworldly, not unlike a churchtent revival, with overtones of holiness and sanctity. The anticipation leading up to that night was excruciating. They opened with the tutti from Close Encounters, which struck like four hammer blows and etched the acoustic dimensions of the arena instantly. It was truly shocking, like hearing real thunder for the first time. Siberian Khatru followed as the lights came up and stage began to revolve. Spoiled from the getgo. A constantly changing perspective and what seemed like an extravagant spectrum of stage lighting. I was also delighted that so many Yessong standards were on the setlist. I recall them playing Future Times and Circus of Heaven ahead of Tormato's release on this occasion. It was obvious they played a tape of Damien at the end of 'Circus' which many listeners did not know what to make of. I was amazed when Awaken was played near the end of the set. Seemed too daunting a thing to try to pull off live. Gutsy and clearly the luckiest bonus of that evening for me. They were so good, much more relaxed and playing with greater authority than documented on Yessongs. Its apparent now that the earlier shows had them all amped up and playing things in tempos frightfully faster than the studio originals. My viewing of the DVD from the Philly dates just 9 months later came very close to my memory of them at that time - full control, not too fast, not too slow. A thing of beauty, chops a plenty but not pushing too hard. Balanced & exquisitely tuned, like a top-of-the-line Jaguar. Overall, an unforgettable event. I promptly went out and bought the rest of the Yes back catalog before the end of that year. There is no describing the sacred refuge these men have created. PS - The event was a sellout because I had the worst seats you could imagine and all I could see were people filling everything below me.